Your revision goal doesn’t give me much hope that revisions actually end! Haha! I’m in the baby stages of my first revision. I hope you finish your goal so that I can see someone else reach the light at the end of the tunnel for some motivation. Have a great week! HA! I tend to revise in stages, mainly because of time constraints, also because I’ll see new things when reading through. Revision is only complete when the book is on shelves, but it is a lot of fun. You can do it! Ooh, I’m so very interested to know what you’re adding to OB&P. And so happy that the revisions are going well. Also, LOVE the interaction with Cal and Ruby. Especially knowing the plot, those last two lines of dialogue are great. Can’t wait to read more of this. I need to email you about the changes. They aren’t the most massive of revisions, but they make a big difference. Yay! So glad you like the interaction there. I really want to get this script finished and off to readers (you! for one) soon. I am pretty into it. I LOVE the little excerpt you shared, Rebekah. I’m already intrigued! Best of luck with your goals for the next week, and please do let me know when you figure out how to balance kiddo time and writing time — my biggest summer challenge, for sure! Glad you are intrigued! I am having a lot of fun with this script. It’s definitely a different kind of story for me. Screenwriting is still like a guilty pleasure for me. Getting a film or TV show made is nearly impossible, so I write them with abandon. And it’s a lot of fun! Have a great week too! That excerpt *swooon* Good luck with your goals next week and adjusting to your son’s summer schedule. What movie did you guys end up seeing? YAY! Swoon is good. We ended up seeing HOW TO TRAIN YOUR DRAGON 2. Highly recommended! Love the excerpt! Writing on a kid’s schedule is soooo hard. My baby is only seven months right now, so that actually might be my biggest challenge of all! How I am supposed to manage to get house stuff done, plus reading and writing, too, and not neglect my son and husband… I am still working these things out. Love the excerpt, Rebekah!! I used to study screenplays to see how everything is pared down to the essentials–dialogue and action. I’m horrible at writing them, but I like your idea of writing them with abandon. Seems very freeing. I LOVED the excerpt! 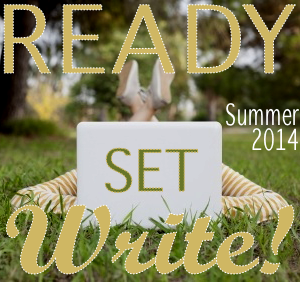 And yeah-I’m adjusting to school being out for the summer and a drop in writing time. But I have faith in us – we’ll figure it all out! Summers are so tough when it comes to writing. I work better at this time of year when I’m not stuck in the winter doldrums, and yet this is when I need and want to do other things, like spending more time with my son, enjoying the nice weather, and working on curriculum. So yeah, I totally hear you on the whole adjustment issue! Hope you find more time for your goals this week, although you did pretty great with the time you squeezed in last week! Love your excerpt! Good luck with your writing goals for this week! Tension – YES! That was the exact word I thought when I read the excerpt. Good luck with your 15 pages this week! Ooh, I feel the tension! Good luck with your goals and adjusting to the summer schedule. Great goals you have for this week. Glad you got things done last week! I don’t care for tension and drama in real life, but in a book or script it’s heavenly!